Change of thread title to make easier to find again! I had a good chance to look at another RAF one today. It seems to be a **/17, but both ricassos have been well scrubbed (I have noticed this on other examples) although the makers name was there and also Enfield inspector marks , and no 're-issue' mark. It was in a 'borrowed' scabbard: there were older serials on the throat along with the 'R.A.F.' mark (as far as I can tell the RAF scabbards were only ever marked this way, not with a RAF-type serial number). I'm pretty sure I have posted it here before but do you have my 11/18 unreissued Sanderson? I did wonder about these bayonets being issued to the RAF in Mesopotamia post-WW1, when they took over the control of that region, but as far as I can see the infantry and armoured units they had were regular army, not RAF. 1.C. (although the '1' in that looks like an 'I' - see the OP. And a search for various permutations of RAF 1.D. 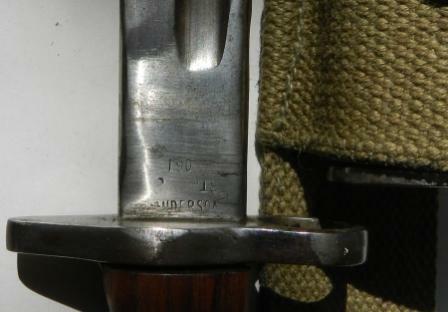 brought up this: http://1914-1918.invisionzone.com/forums/index.php?showtopic=107721 which has N.White's bayonet on it (as in post 3). And it threw up a '1.F.'... And also a comment by 4thG by per ardua ad per mare per terram that "The RAF had over 300,000 serving with it in 1918. I have no idea how many airfields they had to mount guards over. That adds up to a huge stockpile of weapons." ...in a 'borrowed' scabbard: there were older serials on the throat along with the 'R.A.F.' 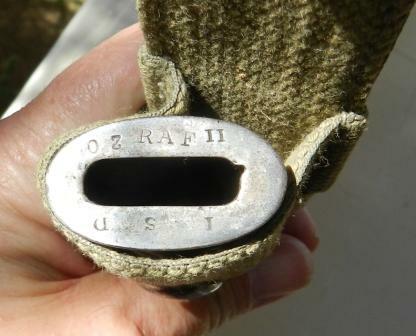 mark (as far as I can tell the RAF scabbards were only ever marked this way, not with a RAF-type serial number). Anyone know of any RAF-marked P.1913's or P.1917's? 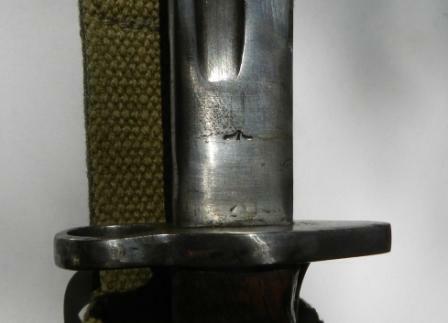 A common slip of the pen, ' Pattern ' for British bayonets as in Pattern 1913, and ' Model ' for American bayonets, as in Model 1917. As I thought. We have the same problem with the rifles. M1917s being called P17s. Thanks guys! M1917 it is then! I had two working explanations for the serial numbers starting with a '1': [A] that they were regional commands; that they were series numbers. Given the existence of a 1.D.9298. I am tending towards the later explanation, so that there would be 9999 numbered bayonets in each series. Thus. 1.0001 - 1.9999; 1.A.0001 - 1.A.9999. In which case, excluding the "A.L. ", a potential 59,994 RAF-marked bayonets. According to this web-site: http://www.bbc.co.uk/history/ww2peopleswar/timeline/factfiles/nonflash/a6649248.shtml: "At its wartime peak, there were 60,000 men in the RAF Regiment." And according to this one: http://en.wikipedia.org/wiki/RAF_Regiment: "the RAF Regiment grew to a force of over 80,000 men in 280 squadrons of 185 men each (each squadron including five officers)." Given the rough match between that potential number of 59,994 RAF-marked bayonets and these figures for the RAF Regiment, then I think it is reasonable to conclude that they probably are all RAF Regiment markings, and so post-1942. Some support for this is found in the majority of the known examples of RAF-marked bayonets having been made 1917-1918, and so 'old' stock issued to the regiment when it was formed in 1942. That said, by 1944, at least one RAF Regiment unit, the No. 2944 Field Squadron near Maungdaw on the Arakan Front, had pig-stickers. So, not proof positive, but nice to know someone else is thinking along the same lines, even w/o the data regarding the manufacture/issue dates of the known examples, which are predominately 1917 and 1918. Post war, the RAF bayonet used was the pig sticker type....there was some reference to the change being effected by the Geneva Convention. 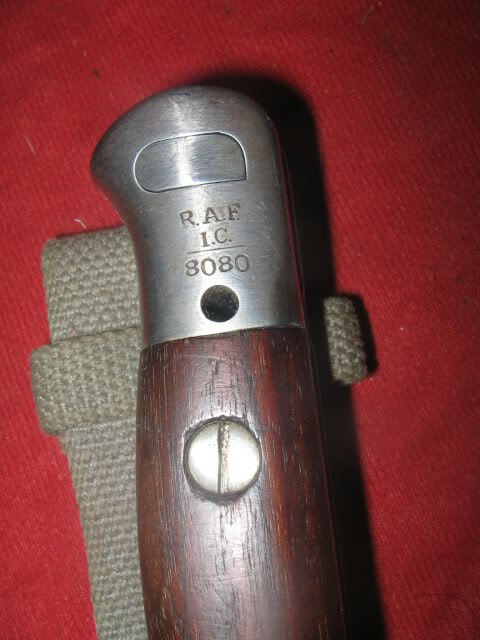 So, why are there all these RAF marked recycled P.1907 bayonets of various vintages? Clearly the RAF were using our old friend the SMLE for a long while but from when to when? I still suspect they are all initial issues to the RAF Regiment after its formation (and so not exactly a GWF issue - except that they are GW period bayonets!). But I don't yet understand the code or system behind the marking, which on the face of it (see post 14) implies one heck of a lot of P.1907 bayonets going there way! My old friend, you really do need to get out and meet people! Why not a new obsession forget Bayonets and try say.........Ah! Roman Pottery! Nah, did that one years ago.... Over-indulged and not quite the same buzz ... Mind you, these RAF ones are only semi-satisfying as I can't find out more about that marking system...! I could never find this thread I started when I wanted to and so I changed the title from "RAF marked bayonets" to "Royal Air Force marked bayonets"! Easier to search for! What prompted me to do this was that I wanted to post this nice bayonet advertised on the Turkish equivalent of a 'well-known' on-line auction site as "SÜNGÜ ÇANAKKALE SAVAŞINDAN NADİR MODEL İNGİLİZ DAMGALARA DİKKAT" or " Gallipoli Battle bayonet rare model - look at the English markings!" It goes on to say "Not enfield ingiliz süngüsü nadir çıkar,Çanakkale savaşında da kullanılmıştır ve ürün resimlerde görüldüğü gibi çil üzeri çok çok temiz damgaları nadir ve ahşap kısımda dahi damga bulunmaktadır kını kendisine ait orjinal kınıdır." 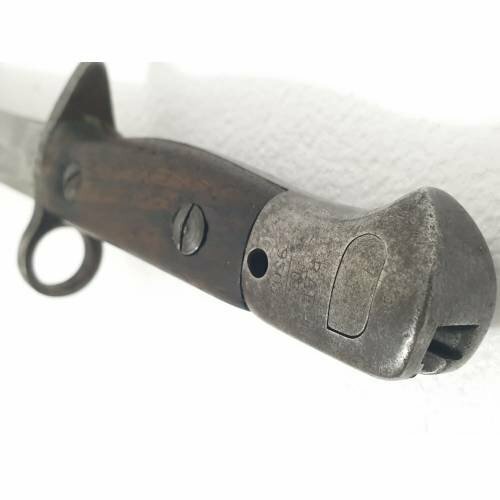 which is - "Note Enfield british bayonets are rare, used in the battle of Çanakkale and as seen in the product pictures, very clean stamps on the ricasso are rare and there is a stamp even on the wooden part." Are you sure of LC? I put a glass on the pommel photo; to me it looks like 1. C. with some corrosion, which is in line with others noted.